This is something I'll probably miss when when I move out of Paris, but the thing is that, often, when you walk down a street here, you come across a piece of art (and I'm not talking about the buildings!). Whether it's permanent like the many statues I already showed you or temporary like this one. It was made by Chinese artist Hong Biao Shen who studied until 2007 at Panthéon-Sorbonne university after his Fine arts studies in Beijing. 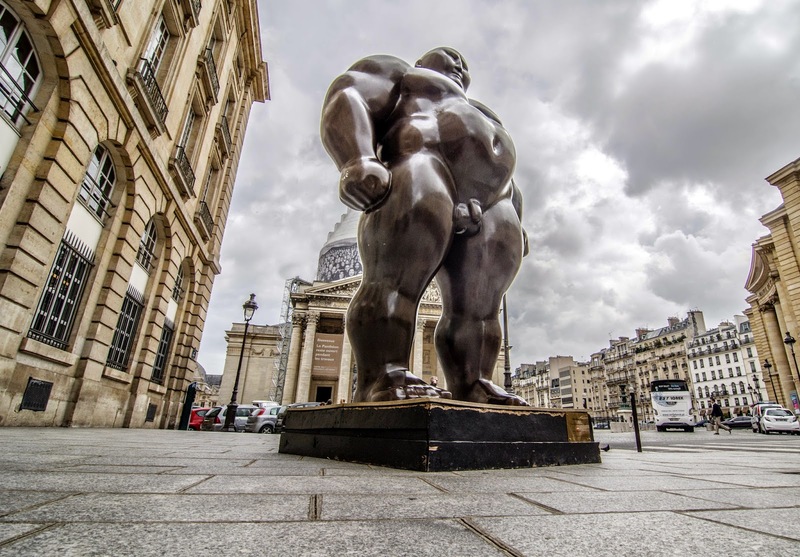 It is now on display at rue Soufflot near the Pantheon, but it's not meant to stay there. Students think it should and they started a petition to "keep the big naked man"! Watch the story in this beautiful video. Before I even read the text, I thought that the figure looked Chinese. Kudos for a good art photo (yet another possible trade--art photographer). And if it can't stay in Paris, perhaps you can petition to move it to your next location. The Sisters Of Little Or No Mercy would be shocked! So you are going to leave the Seine, aren't you ? Well, I will not blame you. There are many things you will not miss at all, do not worry about those you may miss a liiiiiiiittle. I will only wish you : bad luck like the British say! The Brits wish bad luck and that means good luck?! No wonder they also drive on the wrong side of the road LOL! Of course I wish you wonderful new adventures, but I know you'll miss Paris as much as we will miss you! Meanwhile, thanks for the video link—I love it! Merci Alexa. Yes, the video is superb. A powerful statue, I hope he stays, he will be very popular. I hope they convince those in charge to let the statue stay. Impressive piece of art! And you will be leaving Paris? For another "perspective"? Yes, please keep us posted! I say keep the naked dude where he is. Will be interesting to see where you will go when you leave Paris Eric.